Oh, yes, there was talk about weather as farmers gathered for opening day. 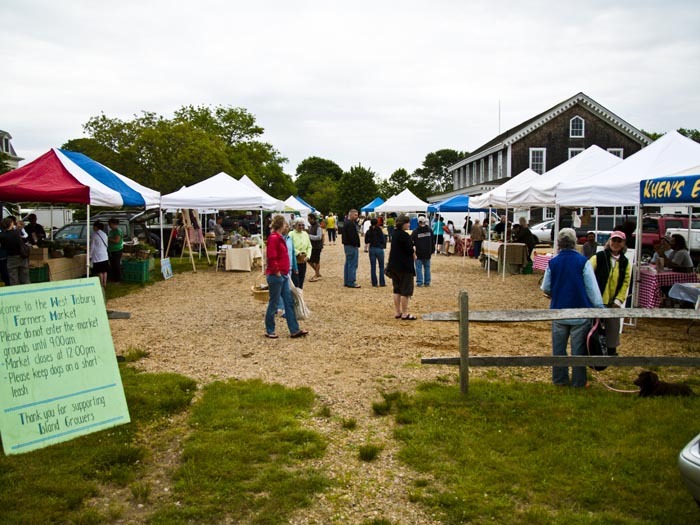 Considering the chilly spring, some might have made dour forecasts for the West Tisbury Farmers’ Market season opener, but they would have underestimated the resilience and enthusiasm of both this Island’s growers, bakers and artisans, and the community that supports them. Saturday dawned grey, but the rain held off for the morning, allowing vendors and visitors alike to buy, eat and socialize at the first meeting of this annual summerlong institution. But the weather, of course, did not go unnoticed by the farmers. 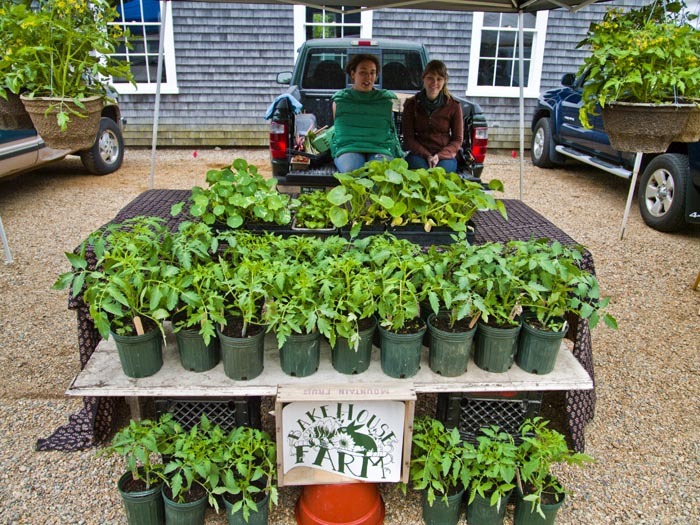 “The heavy rain was a little hard at first this spring, and the wind wiped out our seedlings,” Meg Athearn of Morning Glory Farm explained, “but we’ve got a great crew.” Their efforts were plain to see, from the mountains of greens, to the red, pink and white bulbs of turnips and radishes lining the table. Customers showed up in packs of ten, inquiring after bok choy and strawberries, plucking the farm’s own herbs and greens right off the table. Several providers, including Morning Glory Farm, were involved in a haphazard cross-promotional effort with fellow farmers and bakers. The Morning Glory booth had a bag of shortbread biscuits from the Orange Peel Bakery sitting next to endless baskets of strawberries, conjuring up images of strawberry shortcakes. On top of its freshly sliced bread of all varieties, the Orange Peel was slathering fresh clotted cream from Mermaid Farm across the way. 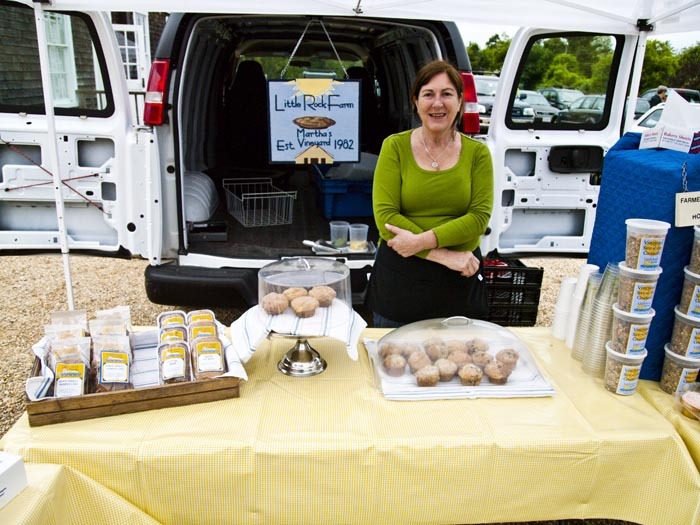 Orange Peel’s baker and owner Juli Vanderhoop called it “cross-pollinating.” The friendly environment among vendors, who encourage each other despite selling many of the same goods at this time of year, reflected a spirit of camaraderie typical of this Island gathering. That is not to say that there is little diversity among the stands and what they sell. In a big tent with cacti lining the shelves outside, and enough space to walk around within, Andrea Rogers sold her handmade brooms. Across the way, Pam’s Provisions, known for its pesto, set up a small table draped with a checkered tablecloth. Beth’s Bakery, now a vendor at the market for 37 years, was piled high with every kind of baked treat the most inventive of chefs could imagine. No matter the size, shape or placement of the booths, each seemed to get a fair share of the business, attracting the customers who strolled up and down the aisle for that perfect ingredient, or the best pastry to go with the coffee they clutched between their hands. At Good Tastes, people were lining up to quench their thirst with the refreshing orange juice, lemonade and citrus coolers. Suzanne Fenn squashed each neon sphere with a silent press, getting all the juice from each citrus orb. As Mr. Gordon was speaking, a little girl in bright yellow Crocs and a sweatshirt that swallowed her came up with her mother, hands gripping at an egg roll so large it was coming apart at its seams. She began to carefully consider the different baskets of strawberries that Mr. Gordon had for sale. The quality of the produce is not lost on even the youngest of patrons. 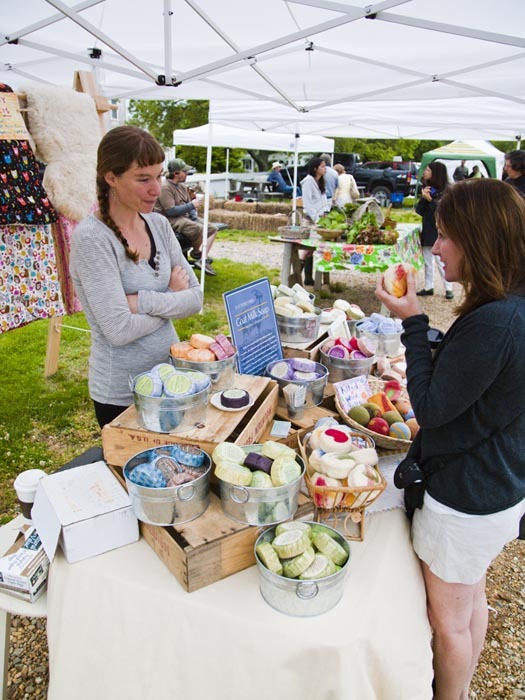 A couple of vendors were missing, but several new stands filled in, including the Bakehouse Farm, Cleveland Farm and the Good Farm, with the Grey Barn and Farm to join them in a few weeks. The jovial and communal atmosphere that characterized the event was bolstered by the country and classic rock standards supplied by the Cattle Drivers, who did a gravelly rendition of John Prine’s Angel from Montgomery, to the enjoyment of several toddlers and their parents who stood around to watch their kids dance, holding half-eaten sticky buns. Customers showed up in packs of ten. Such an image!